With a community garden program established in 1973 and sustainability planning devised in 1994, Seattle has a long history of sustainable urban agriculture. Today, Seattle paints a realistic picture for how cities can approach sustainable urban agriculture, illustrating both the limits and possibilities of a local food economy in the nation’s urban centers. Several city departments help drive Seattle’s sustainable success including the Office of Sustainability and the Environment and the Department of Neighborhoods. Numerous city and private programs encourage urban agriculture, gardening, shared space, environmental preservation and community involvement. Access to local healthy food plays a big role in the city’s planning. By supporting community gardening and backyard farms, Seattle allows its residents to become not only more self-sufficient, but more educated, more aware and more community-minded. 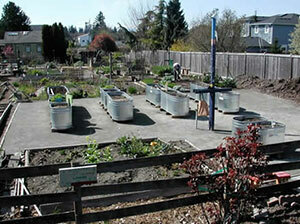 Seattle’s most popular urban agriculture program is the P-Patch community garden program. One of the largest community gardening operations in the nation, P-Patch began in 1973 and today consists of 85 patches comprising 31 acres of urban space including community gardens, youth gardens and several market gardens. The majority of gardens operate in low-income neighborhoods. Approximately 6,000 community gardeners log thousands of hours in volunteer time across the city. The program offers plot fee assistance when needed. A total of 2,850 Seattle’s approximately 600,000 residents have garden plots. The organic concepts behind the community garden program include composting, reusing, green roofs, drip irrigation; water collecting and composting toilets. These have become second nature in the city, presenting opportunities for area businesses who deal in servicing a sustainable lifestyle. With urban forest stewardship, a 70 percent recycling goal and a Food Action Plan to increase equitable distribution of local food, the city is not resting on its community gardening laurels, but is continuing to create sustainable opportunities for residents and businesses. Colin McCrate, owner of the Seattle Urban Farm Company, Seattle’s first edible landscaping service founded in 2007, feels the city is behind the sustainability movement. McDonald and McCrate both see urban agriculture’s overall impact on the city’s economy as small, but the social impact as valuable nevertheless. “If you think about urban agriculture broadly you can include farming, farm-to-table programs, farmers markets, feeding programs, community kitchens,” says McDonald. “From this perspective the social impact is large ranging from people developing an understanding of the source of food to social connections between growers and consumers.” P-Patch growers donated 28,637 pounds to food banks and meal programs in 2013. According to McCrate, Seattle’s urban agriculture culture trends include backyard poultry and rooftop gardens. A large number of restaurants in the city have a garden on site. “Seattle restaurants serve local food—that’s the expectation at this point,” says McCrate. With no transportation, rooftop agriculture supports the city’s commitment to reduced carbon emissions. Hydroponic farming has yet to take a firm foothold in the city, but shared space has begun to take off—one of the newer city programs is the Urban Garden Share Program encouraging neighbors to plant food together. Despite the fact that sustainable local foods have yet to overhaul the Seattle economy, urban agriculture remains a cornerstone of the city’s culture and planning. “Food production in the city is a way to potentially activate underutilized public spaces in a way that promotes positive social interaction at the same time it increases the availability of fresh healthy food,” says McDonald.